The Feedback Sports “The Range” pocket-sized ratchet and torque wrench combo makes trailside adjustments of bolts exactly to torque specs easy. Prestacycle and Feedback Sports have teamed up to create handy, pocket-sized torque wrenches with all the popular 1/4″ bits for trailside or home garage adjustment. The pint-sized unit pairs a small two-way ratchet with a torque measurement dial, but unlike most torque wrenches, The Range is made to help you loosen bolts as well as tighten them. Use the ratchet to loosen a stem bolt, make the necessary adjustment, flip a switch and use the ratchet to tighten the bolt part way. Then grab the end of the ratchet to put the finishing torque on the bolt. As you push down, the dial reads out the Nm capability of your cyclist’s triceps from 2-10 Nm, and will tell you when you’re at the manufacturer’s spec. Sir Douglas Mawson OBE FRS was an Australian geologist, Antarctic explorer, and academic. Along with Roald Amundsen, Robert Falcon Scott, and Ernest Shackleton, he was a key expedition leader during the Heroic Age of Antarctic Exploration. Returning to Australia in 1919 after the war, he moved to Adelaide and the University of Adelaide where he took on a professorship of geology and mineralogy in 1921. He made a major contribution to Australian geology. He organised and led the joint British Australian and New Zealand Antarctic Research Expedition in 1929–31, which resulted in the formation of the Australian Antarctic Territory in 1936. He also spent much of his time researching the geology of the northern Flinders Ranges in South Australia. Upon his retirement from teaching in 1952 he was made an emeritus professor of the University of Adelaide. He died at his Brighton home on 14 October 1958 at the age of 76 years. Mawsons name has been memorialised in many ways, including naming South Australia’s famous South Australian Mawson Trail. 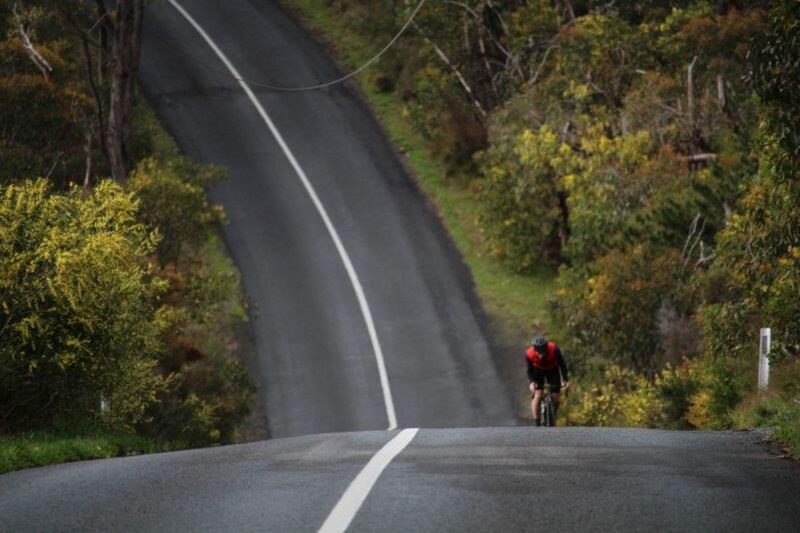 The Mawson Trail is a long-distance cycling trail in South Australia starting just east of Adelaide in the Adelaide Hills and extending almost 900 kilometres (560 mi) to Blinman in the Flinders Ranges. The Mawson Trail is a mountain bike trail over a mix of unsealed back roads, forestry tracks, fire trails, farm roads. The state government has invested in the track with an impressive amount of signage and the trail documentation. The route seems designed by watching the track an ant would take across a map: ie, it’s all over the place. If there’s a direct road between places the trail will usually take some other more deviant route up an adjacent valley then with a hill up-and-over involved. Flic Slakeld and Rob Greenwood, two of the nicest cyclists umeet in Adelaide, have just finished the Mawson Trail. I’ve been following with envy their travels on Facebook over the last week. Rob and Flic have generously allowed me to showcase their trip with photos and facebook commentary. The trail in to the Barossa was a bit nice! So hard to just pick a few photos from our first day. From the gentle entree of Linear Trail to the beginning of Mawson proper, to the rage and pain and confusion of Stone Hut Rd (was NTB tbh) and the tour de bakery that followed. What a day. Now the hard climbing of crossing the Mt Lofty Ranges is behind us, and we are heading into the north and the red dirt country. We rode a winding trail through the old mining town of Kapunda, where copper deposits were found in the 1840s and you can see the remains of the smelters, the chimney and such. Forget good coffee though. Lots of rolling roads between crops of broadbeans, lupins, canola and wheat. And our herpie friends were out yesterday warming up in the sun, including a large pale brown snake that Rob only just missed. Day 3 on the Mawson was a bloody tough day. In Clare we woke to 30kmh winds and rode into them to Burra. Those stunning expansive views were at the expense of any shelter from the relentless wind. Sometimes it was just as fast for me to get off and push my bike. I can’t imagine how much more panniers would have caught the wind. It took us 3 and a half hours to get the 40km to Burra, where we *refuelled. From there we felt better but we were still always always pedalling into the wind 😩 A dance break/Garrett tribute was needed, and lots of food. On from the canola and wheat paddocks of the Gilbert Valley and into the Mt Bryan East area. At the top of rocky ridges we’d have huge views of the ranges and mobs of emus and then dive into dry creek beds full of dusty sheep and roos. All the colours of central Australia. We were so sunburnt and tired, and the 1800m of climbing may as well have been double that with all the fighting with the wind. At 6, we rolled into Hallett, to stay at Joy’s place. 130km and 1800m 😴 for Day 3 *threw food at our faces. Only a 95km and 1,000m leg to Melrose, but we had a forecast high of 30C, and muggy with the change coming. It was a slow day punctuated with lots of water stops and sunscreen. The trail went by a one room schoolhouse in use in the 20s, and a stone memorial to a settler family who came out from England in the 1880s. We reflected on what that stone might represent to the Ngadjuri people who were forced off their country when the Europeans arrived. So tops to ride in to Melrose to see Kerri and Rich at Over the Edge Melrose. We purposely planned a stop here. Day 8: Hawker to Rawnsley Park. Well done Flic and Rob, a fantastic effort across what is a legendary route and country. Your efforts will no doubt inspire others to give it a go. It certainly has got me thinking about something similar. Check out this writeup on La Velocita a year ago ridden by Dave Edwards, Sam Jefferies and James Raison. Some stunning photos and great tips in the comments section. Oh, and you will see Rob Greenwood’s comments a year ago when he started talking about giving the Mawson Trail a go. Well, that didn’t g down as well as the ASO were expecting. Søren Kragh Andersen (Sunweb) was the victor in the first of a new-look Paris-Tours. The 24-year old Dane broke clear from breakaway companions Niki Terpstra and Benoit Cosnefroy with 11km left to ride, and soloed to the finish On the famous Avenue de Grammont to claim victory in a race he finished second in last year. The Avenue de Grammont is located in the center of Tours and is a 3.1km north to south flat long road. The avenue is planted all along plane trees and crosses the place of Liberty and the place of Verdun then it crosses the Cher. Paris-Tours is nicknamed the “sprinters’ Classic” for the way it has traditionally favoured fastmen over Classics specialists, but a revised route this year that featured nine sections of gravel roads swung the advantage back towards the latter, and prompted a very selective race. The revamped Paris-Tours route this year turned it into a classics-style race in the mould of the highly successful Strade Bianche. The seven punchy climbs and nine gravel sections animated the new Paris-Tours in the final 60 kilometres. Carnage across the vineyards of France. The race was also characterised by numerous punctures, with Philippe Gilbert (Quick-Step Floors) and Tiesj Benoot (Lotto-Soudal) among those whose chances were scuppered despite clearly having very good legs. The reaction from riders and team was more outspoken than usual. Quick-Step team boss Patrick Lefevere was so disgusted by the route, he tweeted during the race his team will not return next year even if his team were to win. Niki Terpstra finished second behind winner Soren Kragh Andersen (Sunweb). My opinion, anything that can liven up the race and make it spectator friendly rather than the modern day metronome style racing has got to be beneficial to the sport, so I say well done ASO. In huge news it has been announced the New South Wales South Coast city of Wollongong will host the 2022 World Championships. Described as a “coup for the State” by NSW Sports Minister Stuart Ayres, the Minister said the eyes of the world will be on Wollongong for eight days come 2022. Expected to attract at least 1000 athletes, some 300,000 spectators and a global viewing audience in excess of 200 million people, the event will also deliver up to $100million to the state and regional economies. I don;t think it’s any secret that South Australia had been angling for a shot at the next hosting of the UCI World Championships, and being a passionate South Australian i know we wold have put on one hell of show, but chapeau to Wollongong for their success and looking forward to great event.